Carl Froch and George Groves are set to do it all over again as both parties having agreed to the terms, if the first fight is anything to go by, we’re in for a treat! 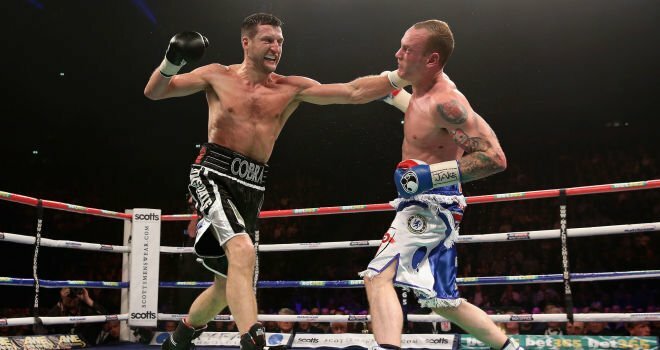 Carl Froch beat George Groves in the first encounter after referee Howard Foster prematurely ended the fight giving Froch the win by knockout, Groves has since campaigned to get his rematch citing “inappropriate conduct” by the referee, he went to the IBF to try to force it through. Groves got his wish after the IBF ordered a rematch, both parties were struggling to agree on terms after Groves wasn’t happy with the 15% purse which was offered to him. By the IBF ruling, Groves deserves only 15 percent of the purse due to him not being ranked #1. Groves is currently ranked #6 by the IBF. However, both parties have agreed on the terms and are set to battle it out on May 31st. Speaking to Boxing Scene, IBF chief Daryl Peoples said the pair have “come to an agreement” and as a result “will not go to purse bids”. He added: “It is an excellent fight, great for the IBF and the UK, and I understand that there’s been quite a demand for it. They are two top-notch fighters. Matchroom promoter Eddie Hearn is confident the fight will take place in a football stadium. Soon as the IBF confirmed an agreement for Froch-Groves II had been reached, the 36-year-old Cobra said: ‘The two dream fights for me before I retire are one at the City Ground, then the other in Las Vegas. So it looks like they’re both coming true. I’m glad the re-match is happening, hopefully won’t be to controversial this time.